Actually, despite my hatred of the place (not to mention the redesigned shite parking lot), the best 排骨飯 (pai gu fan) in Irvine IMO is at Tea Station. At least for me, it's what I remember eating as a child in Taiwan. All the new fangled ones, including the one at Chef Chen all tend to be a bit on the sweet side for me. One other note of caution however, It's also more expensive. But then so are the tapioca drinks at tea station. awww, that is sad that Nice Time Deli closed.. i used to get the squid vermicelli there. good to know that there's more to eat in that plaza. I like Tea Station's pai gu fan, too. It seems a different style than Nice Time Deli, and it goes well with the fried egg they used to include. Here's my earlier post on Tea Station. Yes, gone gone gone. And not only that replaced! There is now a Shandong-style dumpling joint in its place! I can't tell if you are talking about Nice Time's pork chop or Chef Chen's pork chop in the various paragraphs in this article. 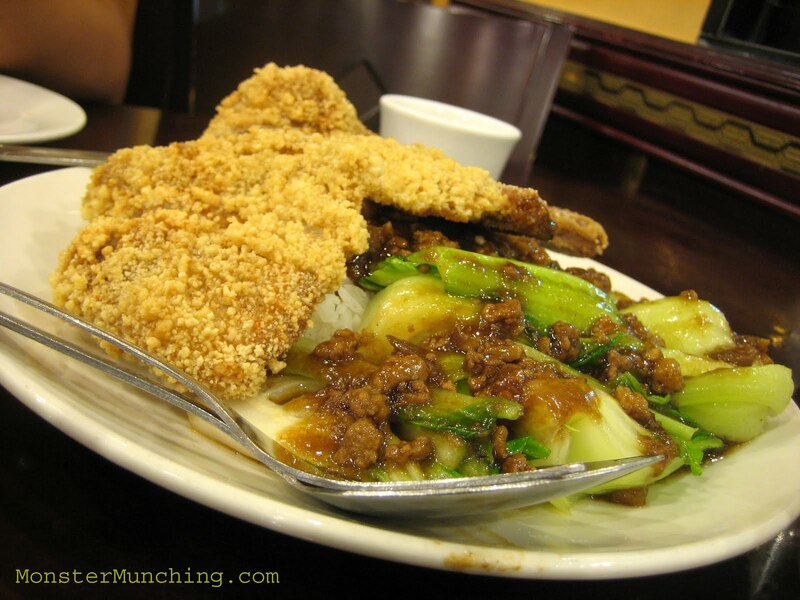 I also can not determine if you like Chef Chen's version or if you like it or what you like/dislike about it? I guess I am glad that you showed us where to get it though. I had my [Chinese] New Year's Day feast at Chef Chen back in February. 'Twas...ok. The vaunted Lion's Head Meatballs desperately needed some hot sauce. Our New Year dumplings were satisfactory. The niu rou shao bing was the best thing on our table. Yes there are hits and misses here (the xiao long bao is passable), but the pork chop is great. Better than Nice Time's? Can't say, but even Nice Time had its ups and downs. Too bad I can't do a side-by-side comparison anymore.